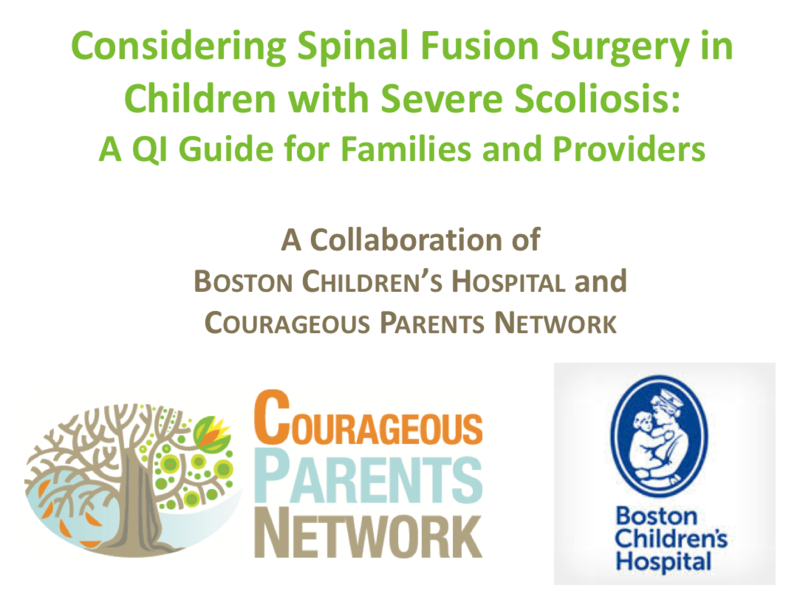 Courageous Parents Network and Boston Children’s Hospital collaborated to develop a Guide and Videos to help families of children with severe scoliosis and their providers decide together, through a thoughtful process of shared decision-making, what is in the best interest of the particular child and family. Watch videos featuring parents who have made this decision, as well as a pediatrician and a surgeon discussing the decision-making process. Treatments for scoliosis include observation of the curve, physical therapy, bracing, growing rod insertion, and spinal fusion surgery. Growing rods are rods that are surgically implanted on each side of the spine. Once implanted, some types of rods require subsequent surgeries to lengthen the rods, while other types of rods can be manipulated by the surgeon using a remote control outside the body. Spinal fusion is a major procedure that uses rods and screws to stabilize the spine in patients with scoliosis. When is spinal surgery considered? Spinal surgery may be considered when scoliosis is causing pain, difficulty with positioning or difficulty breathing. How do you approach the decision making process? Making the decision to proceed with spinal surgery may be challenging. You are not expected to make this decision by yourself. Your child’s surgeon and other clinicians are there to help you explore all the options available to treat your child’s scoliosis. We have created a six-step decision-making guide to help you with this process. [download pdf above] Each step has videos you can watch where a parent, an orthopedic surgeon and a pediatrician talk about the decision making process. Step 1: Understand how Scoliosis may affect your child. There are several reasons why spinal fusion may be considered for a child with scoliosis. Think about these reasons (and any others that apply to your child) in terms of how they affect your child’s health and wellbeing. Step 2: Understand your hopes and concerns about scoliosis, surgery, and your child’s well-being. Think more about each of the reasons you are considering spinal fusion for your child. It can be helpful to write down the hopes and concerns you have for each of them. Step 3: Explore surgical options for scoliosis. You are not expected to make this decision by yourself. Your child’s surgeon and other clinicians are there to help you explore all the options for treating your child’s scoliosis. It is possible and natural that your thinking and responses to the questions below may change as you work through this decision-making process with your child’s care team. Step 4: Assess the risks of spinal surgery. Keeping your child safe and stable during and after surgery is a top priority for everyone. It’s important to work with your child’s healthcare team to learn what risk factors your child may have that could affect their health and safety when undergoing spinal fusion surgery. Step 5: Make the decision about surgery. Now that you have finished Steps 1-4, think about the risks and benefits that you identified for each option you are considering. Again, these options may include full correction with spinal fusion, partial correction with spinal fusion, placement of growth or magnetic rods, or no spinal fusion or rods placement. Step 6: Discuss the decision with your child. This step is completely optional and up to your discretion as the caregiver of your child and the person who knows him or her best. Depending on how much of this information your child is able to comprehend and what is appropriate for them to understand, you may or may not want to explain which options you are considering for your child, why, and the outcome you are hoping for.